The attached letter is from Mr. D.J. Ballinger, president of the international canal organization Inland Waterways International, containing a resolution of support for the preservation and wise use of the remains of the James River & Kanawha Canal in Richmond. Originally known as the James River Canal, it was the first operating canal system with locks in America. It first opened in 1789 and was completed into the Great Basin in 1800. The canal company elected George Washington as its honorary president and gave him a grand tour in 1791. Today, much of the canal is still intact in Richmond. The resolution was passed at the annual World Canals Conference, held this year in Yangzhou, China, on China’s Grand Canal. For 25 years these conferences have been held annually in America or Europe, and now, for the first time, in the far east. This one was held in conjunction with the Sixth World Canal Cities Expo, which has been held annually in Yangzhou. The Chinese are making the most of their canal heritage. Communities along its length are working together to nominate the Grand Canal as a World Heritage Site, and are using it to create beautiful parks and waterways much beloved by both tourists and those who live there. Efforts like this are going on all over the world. Richmond rightly prides itself as a River Town and has learned much from other river cities. But Richmond is also a Canal City. The technology and philosophy of canal park development is not the same as river park development. We need to work not only with other river cities, but with other canal cities and canal parks to learn how we can put our historic canal to its best use for our city. The sweep of the canal around Oregon Hill is in danger and needs our help. 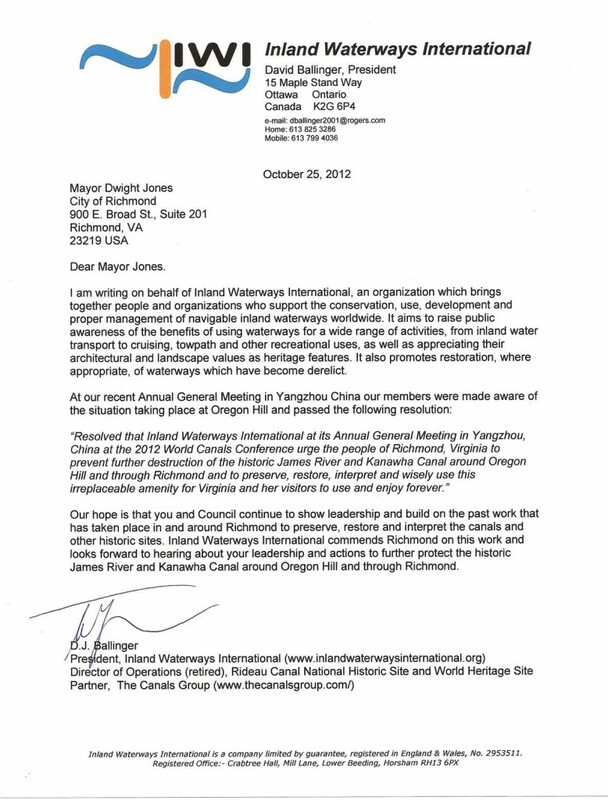 Letter supporting the canal in Richmond, VA from Inland Waterways International.